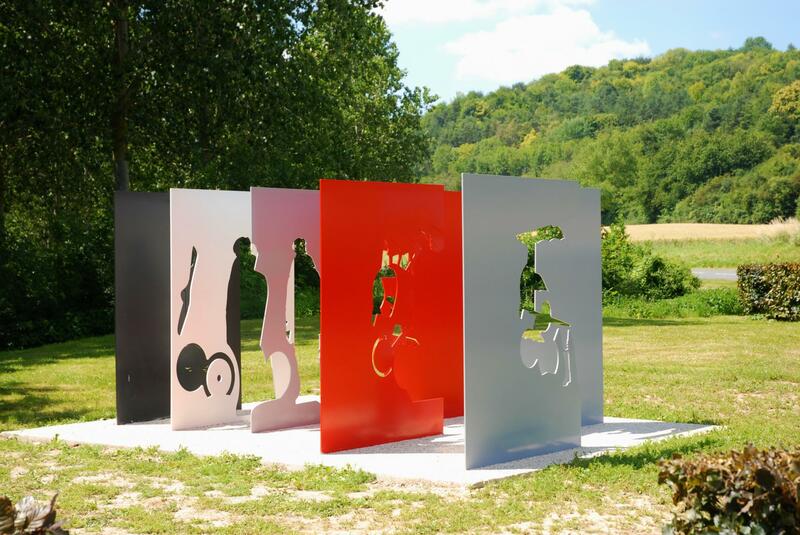 Explore the Val de Somme and discover the new "Memory in Perspective" circuit, composed of four anamorphic work of art !. 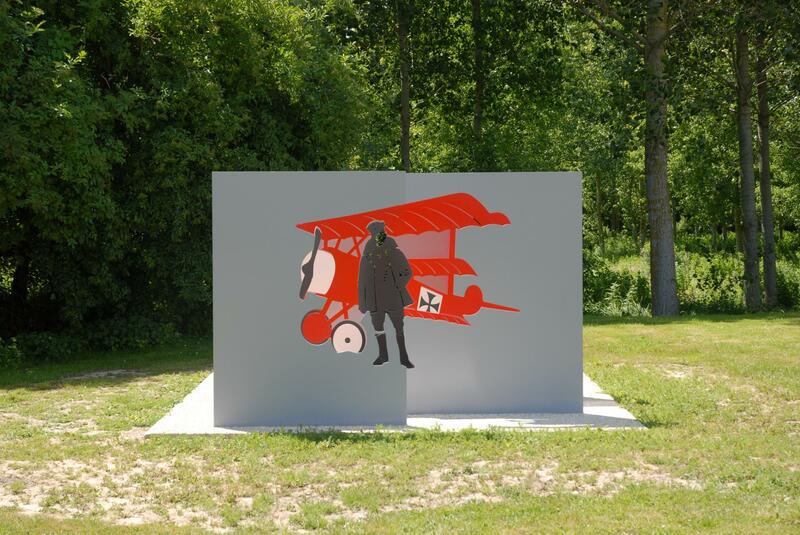 Roam through the Val de Somme and set out on the “Remembrance in Perspective” trail. The trail includes four commemorative works of art representing four illustrious figures of the Great War in the Val de Somme 1914-1918. These contemporary works were created using an unprecedented and unusual technique: anamorphosis, an original method, which plays with angles and perspective in the same way as a optical illusion. Move around on the concrete base a few meters in front of the piece to see what it represents. Explore the Val de Somme on your quest to find the four anamorophoses! In doing so, take the opportunity to visit other remembrance sites, such as the Australian National Memorial, the new Sir John Monash Centre, the site of the very first tank battle or the place where the Red Baron crashed his plane. SO WHO ARE THESE ILLUSTRIOUS FIGURES? Impressed by the stories of the first aerial combats, he changed regiments to become an aviator by the end of 1915. He was quickly considered one of the best pilots of his time, and even became "the ace of ace" of the Grande War. His record is 80 wins. Furrowing the sky with his Fokker DR.I red triplane, he is nicknamed "The Red Baron". On April 21, 1918, he took off from Cappy Airfield to accomplish what would be his last mission. After a legendary pursuit race with the Canadian Air Force, he was shot down over Vaux-sur-Somme by Australian fire. Mortally touched, he lands in disaster on top of the hill facing the brickyard. On July 7, 1918, Georges Clemenceau, President of the Council and nicknamed "Père la Victoire" personally came in the town of Bussy-les-Daours where were resting the soldiers of the Australian army. He came to thank them and congratulate them for winning the Battle of Le Hamel. It is one of the founding acts of Franco-Australian friendship. A passage of his speech is engraved on the Memorial of the Australian Army Corps in Le Hamel. When the Great War began, Georges Guynemer was declared unfit by doctors because he was too puny. In 1915, however, he managed to become an aviator. Very skilled at handling planes, he won many victories that brought him into the posterity of the "Ace Aces" of the First World War. After many fights over Verdun, April 16, 1916, he joined the airfields of Cachy. It was during the Battle of the Somme, April 1, 1916, that his squadron took the name "des Cigognes." He fell in action in Poelkapelle, Flemish Belgium, on September 11, 1917.